Harri Koskinen’s objects have attracted considerable international interest. 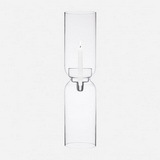 The Lantern candleholder is a light sculpture designed with clear and clean lines. The reflections of the candle inside the mouth-blown glass create an illusion of light floating on air.